It's been a long time coming. When the Homelander finally sets an army of superheroes against the forces of the United States military, Billy Butcher and The Boys must finish the job they were recruited for: to take every superhero out of the picture. While the battle rages on the White House lawn, Frenchie and the Female are unleashed, Mother's Milk uncovers a terrible se It's been a long time coming. When the Homelander finally sets an army of superheroes against the forces of the United States military, Billy Butcher and The Boys must finish the job they were recruited for: to take every superhero out of the picture. While the battle rages on the White House lawn, Frenchie and the Female are unleashed, Mother's Milk uncovers a terrible secret at Vought-American, and Wee Hughie discovers the senses-shattering truth behind Butcher's ultimate plan of vengeance. Garth Ennis and Darick Robertson proudly present the final, bloodiest chapter of The Boys, collected in a gorgeous hardcover package, complete with a slipcover. It's been a long time coming. When the Homelander finally sets an army of superheroes against the forces of the United States military, Billy Butcher and The Boys must finish the job they were recruited for: to take every superhero out of the picture. While the battle rages on the White House lawn, Frenchie and the Female are unleashed, Mother's Milk uncovers a terrible secret at Vought-American, and Wee Hughie discovers the senses-shattering truth behind Butcher's ultimate plan of vengeance. 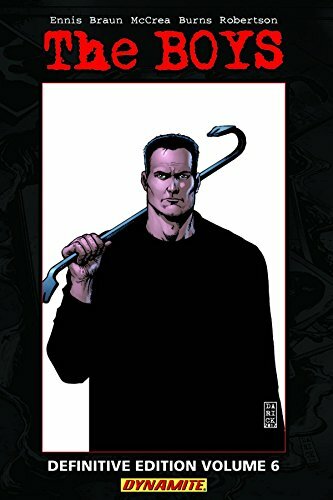 Garth Ennis and Darick Robertson proudly present the final, bloodiest chapter of The Boys, collected in a gorgeous hardcover package, complete with a slipcover.